In Episode 21, I talk to life coach Annie Huang. Annie is an expert on how to handle life’s difficult transitions because she’s been through many transition in her own life, from relocation to a new country to going through painful relationship breakups. A former lawyer and UN human rights advocate, she now helps women through times of transition in her life coaching practice. If you are transitioning and finding it challenging, you will love this episode. Annie Huang has experienced many major transitions personally, professionally and geographically over the years. Her experience and strong desire to help other women through transitions led to her to start her own coaching business. Through Love Your Journey, Annie empowers women in transition who are struggling to find their feet when the ground shifts. She encourages them to embrace change and enjoy their unique journey. It’s important to have support networks around you when you’re going through tough transitions. When you have a very strong body, it’s hard to be anxious. –When your body is hurting it’s hard to stay positive. People underestimate the connection between body and mind. Everything happens for a reason, the good and bad. Tomorrow is a new day, fresh with no mistakes in it. We all need people in our lives that believe in us. If we don’t have a clear boundary between work and personal time, the work time tends to extend into personal time. Nanna naps! They are awesome! Most people spend half an hour more on Facebook and Youtube and that’s not very productive. A nap re-energises you and lifts your productivity. Isolation is our biggest enemy. Often when we’re going through a major transition, we can feel like we’re the only ones going through that or the only ones suffering. That’s not true. We need to be compassionate with ourselves. At times of transition, it opens up new opportunities for you to do the things you’ve always wanted to do. 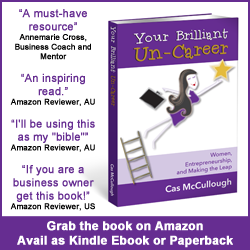 Chapter 11 of Your Brilliant Un-Career talks about overcoming the mental and emotional barriers to success. I have done a terrific interview with EFT therapist Sally Thibault on this topic that I want you to have. Access this interview for free here, along with 32 other business building podcast interviews, templates, worksheets and motivational affirmations.